Cape Town’s autumn months of April and May are generally accepted as having the fewest flowers in bloom. This may be true in sheer numbers but with a fifth of the fynbos in flower at any time of year, it’s not like you’ll see nothing. And anyway, autumn is a desperately exciting time – well, for botanists. Forget the northern hemisphere thing of everything dying off in preparation for winter; autumn in the Cape mountains means “Get Going!” The coming winter is a season of great plant growth and a multitude of flowers plus breeding birds and foraging wildlife, all taking advantage of the year’s wettest and mildest weather. Autumn’s combination of warm sunny days and cool, dew-filled nights is what starts it: a mass germination of seeds and bulbs buried in the ground. Green shoots and leaves start to poke out of bare sand just as the year’s first decent rains arrive, carried in thick clouds full of cold Atlantic water. 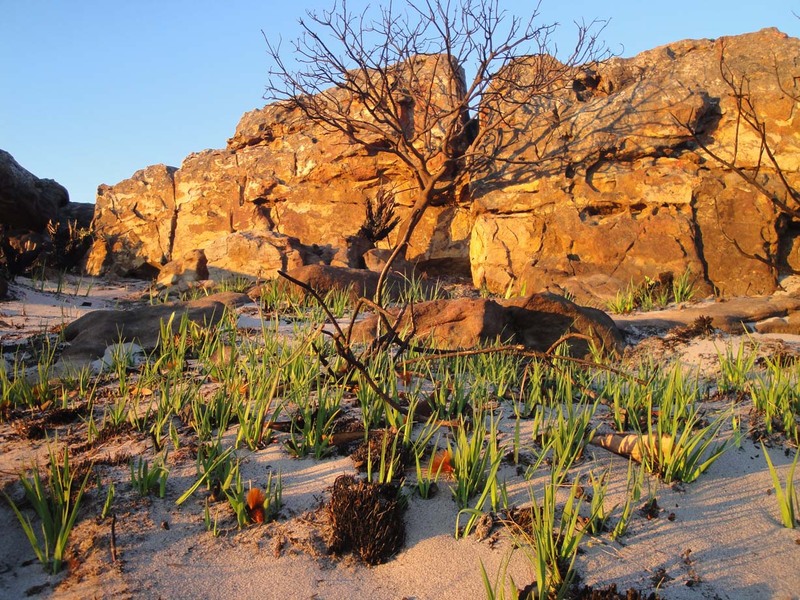 The earliest flowers to bloom are usually in the oxalis family – sorrel is their old English name – and they were a welcome sight for the scurvy-addled eyes of sailors newly arrived at the Cape after months at sea. Chew the leaves and stems of many oxalis species and you’ll get a hit of lemon juice – that’s oxalic acid, the stuff Vitamin C is metabolised into when it’s in our bodies and it’s a remedy for scurvy. 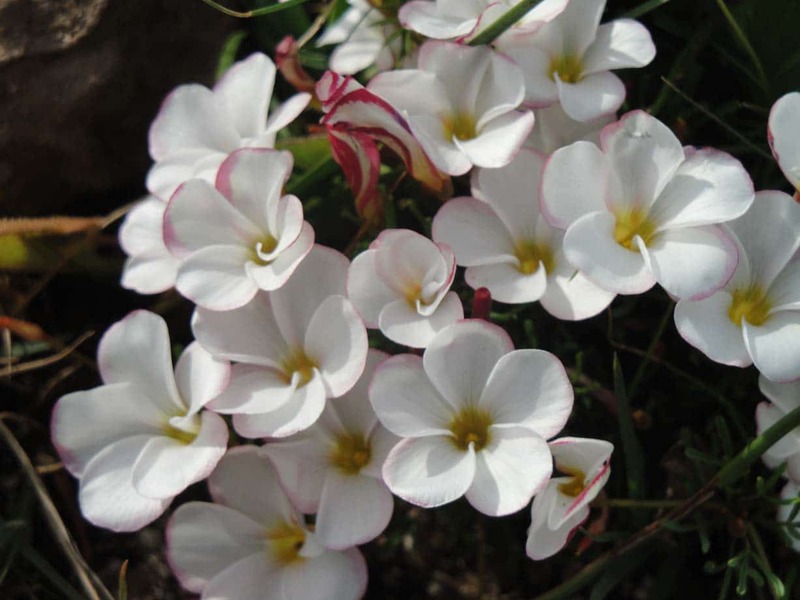 With dainty porcelain-like flowers, Oxalis versicolor is one of the many sorrel species that flowers in autumn. You’ll see a lot of red flowers in autumn. 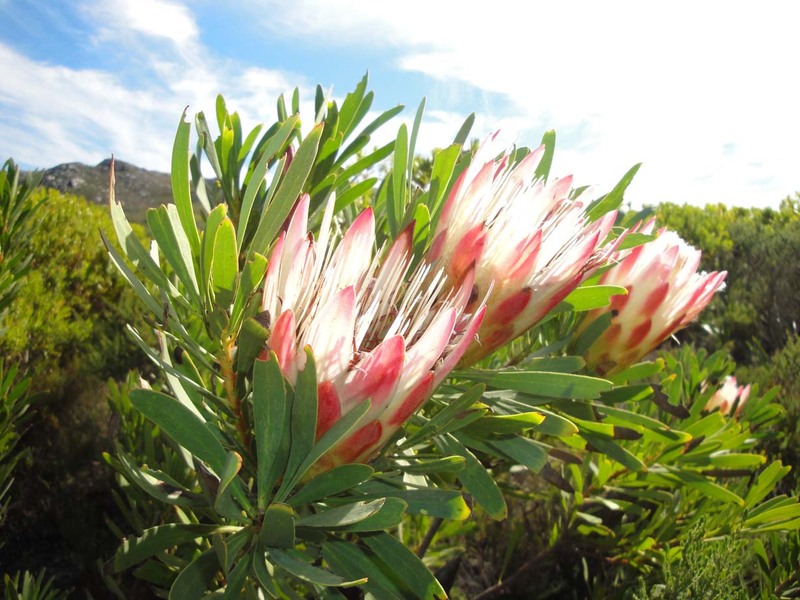 The fynbos is still being serviced by one of its most diligent pollinators – the Table Mountain Beauty Butterfly. Irresistibly drawn to any shade of red, the butterfly pollinates at least 15 species and is the sole pollinator of at least one of them (the Red Disa – Disa uniflora). Several red-flowering heathers are taking advantage of the last few weeks of the butterfly’s hard-working life but nothing matches the red-faced audacity of a few Amaryllis species. 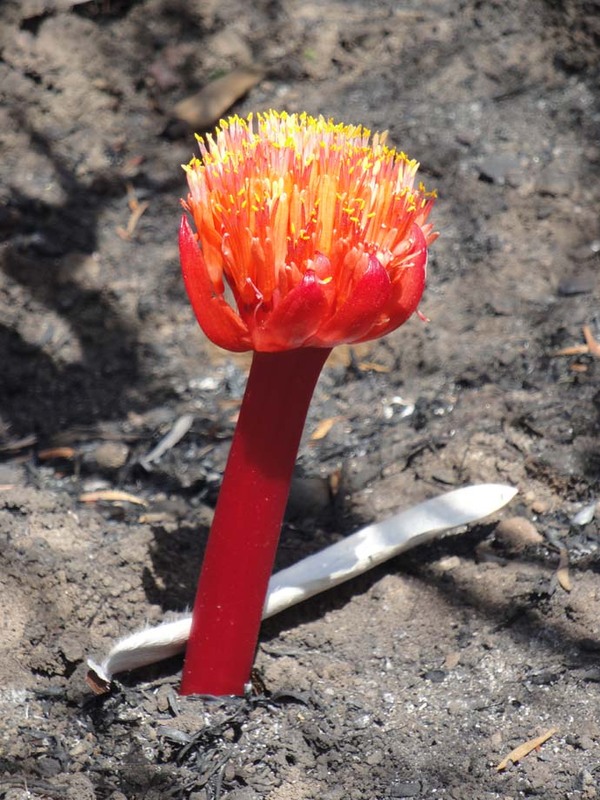 The Paint Brush Lily (Haemanthus coccineus) is hard to miss, especially in a recently burnt landscape. Known also as an April’s Fool Lily (guess which month it flowers in), the Paint Brush Lily (Haemanthus coccineus) is striking enough in appearance but is swept aside by the arrival of Candelabra Lilies (Brunsvigia orientalis) a few weeks later. 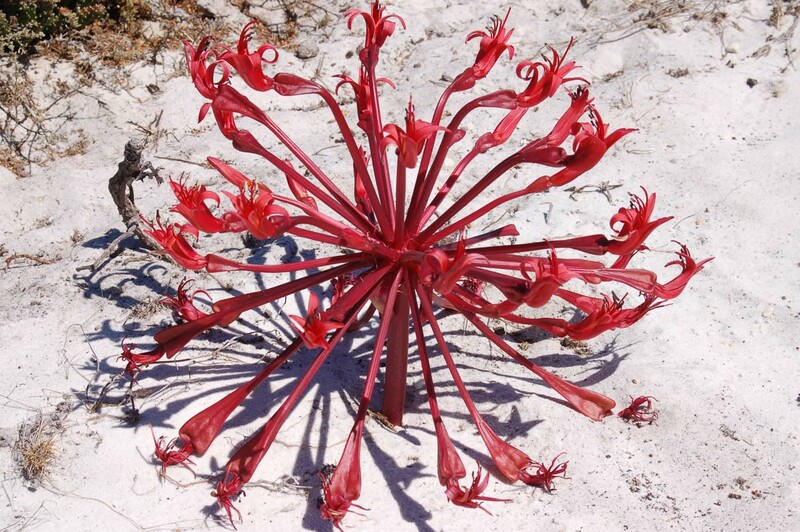 Not only do the Candelabras thrust out a double fistful of scarlet flower stalks but they make them strong enough for sunbirds to perch on – just in case the butterfly runs into bad weather and can’t make it. The full spread of Brunsvigia orientalis, complete with sturdy perches for pollinating sunbirds. Other red flowers catch the eye of the autumn hiker – the Sugarbush (Protea repens) and the Red Afrikaner (Gladiolus watsonius) for example. Growing several metres high given the chance, the Sugarbush once served as our sugar jar, its bold flower heads drip with nectar in early autumn, a resource once collected by the European settlers and boiled down to make sugar syrup and cough mixture. 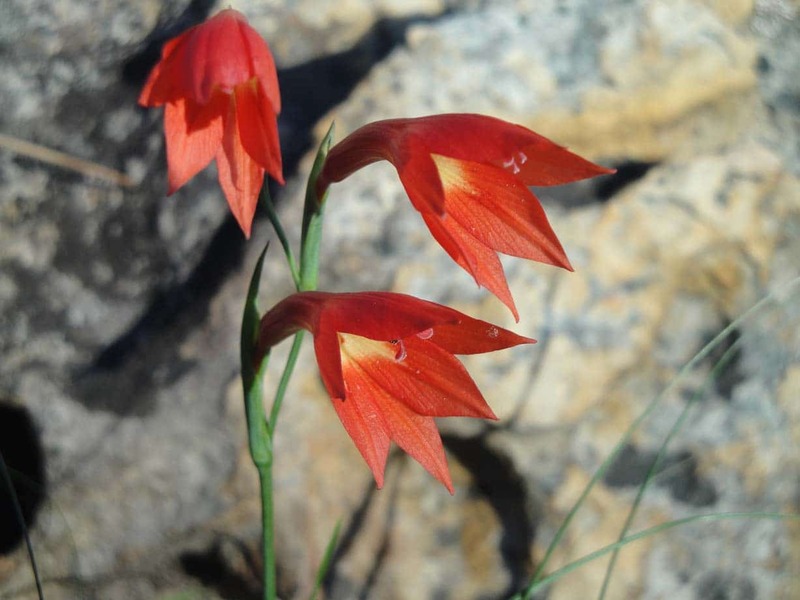 The autumn-flowering Red Afrikaner is one of the 100 or so types of gladiolus found in fynbos. Sugarbushes backlit by the morning sun: turn the flower heads upside down & sugar-water drains out of them. But nothing beats the extravagant growth of a recently burnt patch of fynbos. 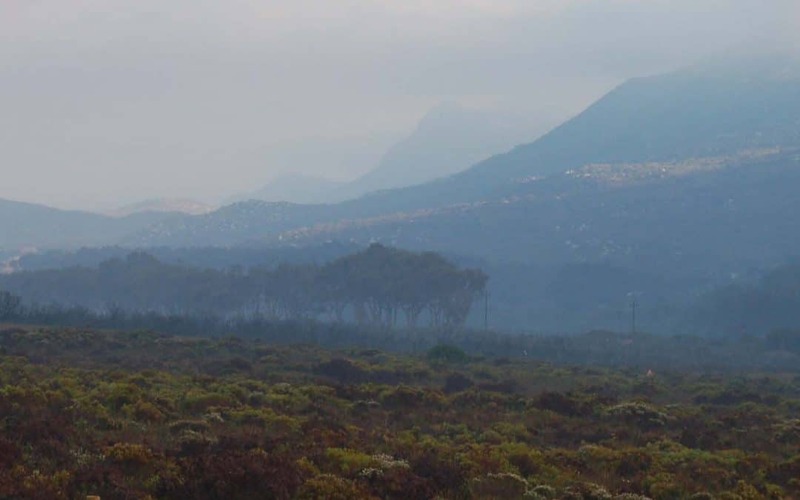 The Cape’s late summer is the best time for a fire in fynbos: the flames clear old debris, revitalise the soil with ash and expose countless seeds and bulbs to sun and rain. Add autumn’s weather and suddenly the burnt-white sand erupts into greenery. Watsonias, long-leafed members of the Iris family, are especially obvious. Under non-fire conditions around 10% of their underground population bother to come up for the year and flower; after a fire, up to 80% of the buried bulbs hurriedly race upwards, covering mountainsides in carpets of orange or pink in summer. Many other irises are also waking up as are orchid and hyacinth bulbs, preparing to send up stalks topped with outrageous flowers in dazzling colours. But we have winter to get through yet. 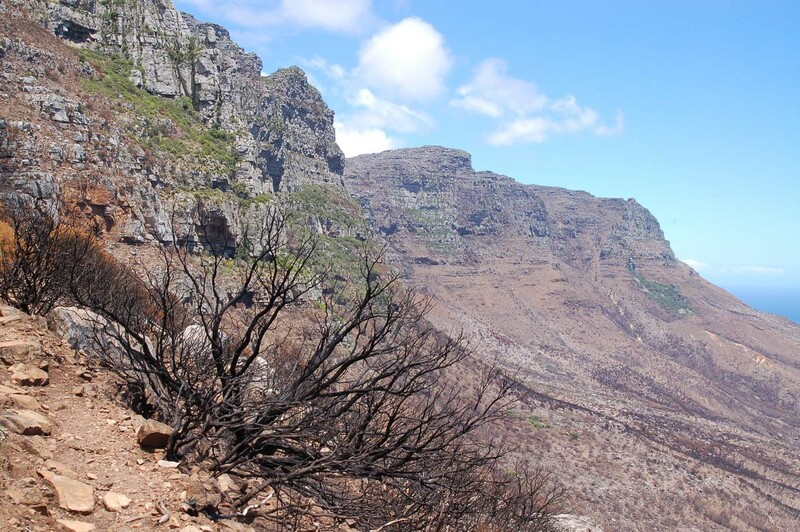 The perfect sight in autumn: freshly burnt mountains – in this case the 12 Apostles in Cape Town – waiting for winter rain.